(Nanowerk News) An international team of astrophysicists led by a Johns Hopkins University scientist has for the first time witnessed a star being swallowed by a black hole and ejecting a flare of matter moving at nearly the speed of light. 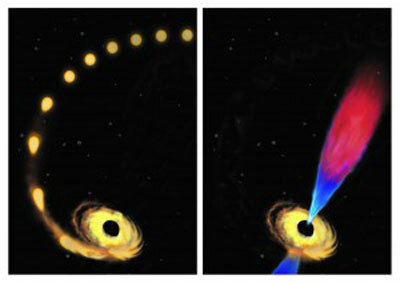 The finding reported Thursday in the journal Science ("A radio jet from the optical and X-ray bright stellar tidal disruption flare ASASSN-14li") tracks the star -- about the size of our sun -- as it shifts from its customary path, slips into the gravitational pull of a supermassive black hole and is sucked in, said Sjoert van Velzen, a Hubble fellow at Johns Hopkins. Black holes are areas of space so dense that irresistible gravitational force stops the escape of matter, gas and even light, rendering them invisible and creating the effect of a void in the fabric of space. Astrophysicists had predicted that when a black hole is force-fed a large amount of gas, in this case a whole star, then a fast-moving jet of plasma - elementary particles in a magnetic field - can escape from near the black hole rim, or "event horizon." This study suggests this prediction was correct, the scientists said.